Learn how to create, edit, and import items from the Square Dashboard. You can also use Square to track your inventory. 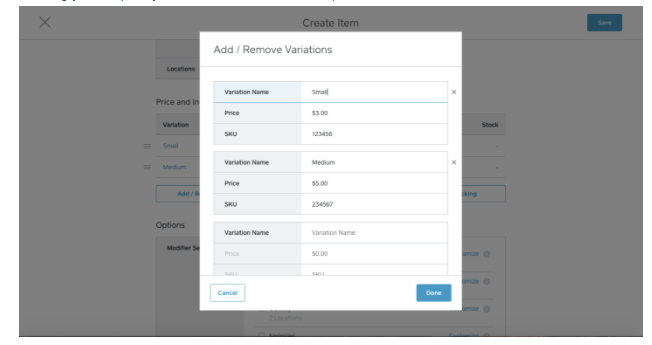 If you’re using Square for Retail, creating items is your first step towards a simplified (yet robust) inventory management system. Visit Items from your online Square Dashboard and click Create Item at the top-right corner. Note: All item creation and editing will display in a fullscreen window. To return to your Items, please select the X in the top left hand corner. Fill in the item information. Note: Item descriptions have a 4000 character limit. Fill in the variation information. If your item has a bar code, add the SKU or UPC in the SKU field. You can add variations to an item by clicking Add Variations in the single variation view and Add / Remove Variations in the multi-variation view. This will open up the screen below allowing you to quickly add a new variation name, price, and SKU. To edit the properties of a single variation, click on the variation row to open up variation editor. Note on employee permissions: Employees are only able to edit variation prices at the locations where they have access. 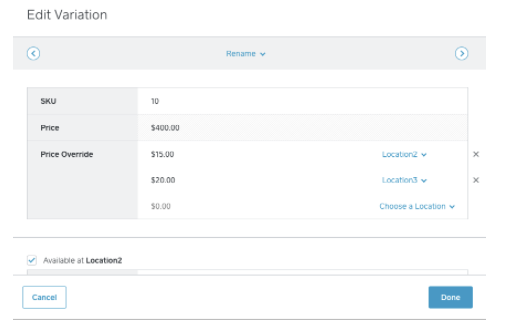 If the employee does not have access to a specific location, they are unable to update variation prices at that location. Once you complete editing properties for the item, click Save. Note: If you are creating multiple items, you are able to upload your items in bulk using Square’s Import Tool. Seller Community: Ask questions, get answers, and hear how other Square sellers are managing their item library. Categories simplify your item library and sales reports. Log in to Categories from your online Square Dashboard. Name your category (i.e. Drinks, Food, Jewelry). Click Assign Items and check the box next to each item you wish to include. Log in to Items from your online Square Dashboard. Click on the item you wish to delete. Click Delete > Delete Item to confirm the change.